Since they're actually doing work on the old Blue Rock quarry site on Main St. in Westbrook (the old loading equipment by the RR tracks has been removed, and earth movers are on site), I'm going to start this thread and hope it doesn't get jinxed. This is the Market Basket development across Main St. from Kohl's and Rowe Ford. Pivot! Now they're planning to ask to turn this into a mixed-use development with 750 apartments. They have a site for the new project here but there's nothing there yet but a way to ask for info. 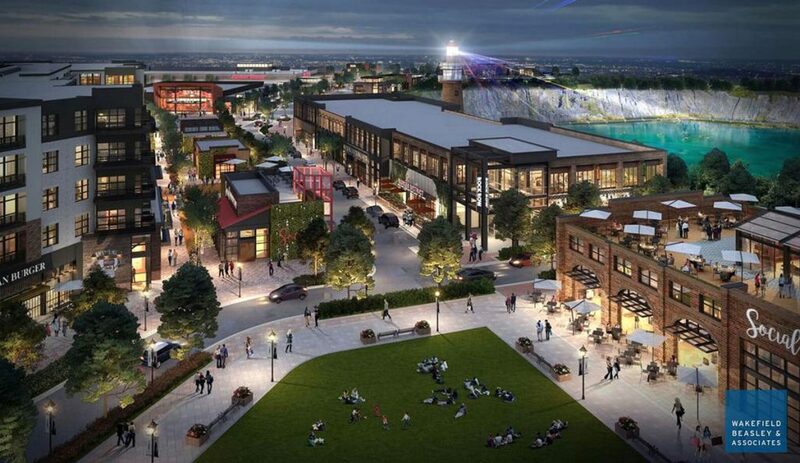 They also want to include a movie theater and concert venue in the retail space (which is being cut back by 50,000 sq. ft.) I wonder if they had trouble filling all the original space, which would have been much cheaper to build. HUGE design change! and a very welcome one. I even like the fake lighthouse As far as I know Market Basket has already started construction, so this new plan must be for a later phase of the project. Perfect location for this type of development too. Easy highway access, right between two population centers but not close to any residential areas to create NIMBY backlash. I've seen developments similar to this in Burlington (VT) and they are a far more enjoyable experience than traditional suburban retail. The Portland area has needed more development like this for a long time. Last edited by Cosakita18; 05-10-2018 at 07:41 AM. I agree that this is a perfect location for a development like this. These developments are already prevalent in other states....but with Maine being Maine. I think that something like this could work at the site of the Bangor Mall as well...maybe not on such a large scale but with the housing/retail/dining/services mix. Honestly, though, I was far more interested in the Margarita's and Firehouse Subs (and Chick-Fil-A) that were shown on the earlier marketing material than I am in another Elevation Burger and the brewpub thing. This development has a new name and a website (only one additional render from those above) Rock Row. Best viewed in Chrome; some of the effects don't work in Firefox. Site works seems to have ground to a halt there lately. I haven't seen much activity other than the Hampton Inn going up (which isn't part of the development). I wonder if this has to go back before the planning board? It's not fake! It keeps ships from running aground on the sides of the quarry! It very well may, particularly with the 8000 seat outdoor concert venue they're listing on the website. I have to imagine that that will open their traffic movement permit back up as well. I don't have the link handy, but the developers will be at the Westbrook Planning Board on July 17 for what is being billed as an "informational workshop" but not yet a formal submission. * The building shown down next to the water in the quarry won't exist; the presenter said that the architect got carried away with that one. No word on the lighthouse. * For tenants from the earlier marketing materials, Starbucks is still in, Margarita's is out, and they're talking with folks from Chick-Fil-A this week. Chick-Fil-A is actually their number 1 most requested tenant. * They're going to be going before the Planning Board at their second meeting in August with a revision to the site plan. 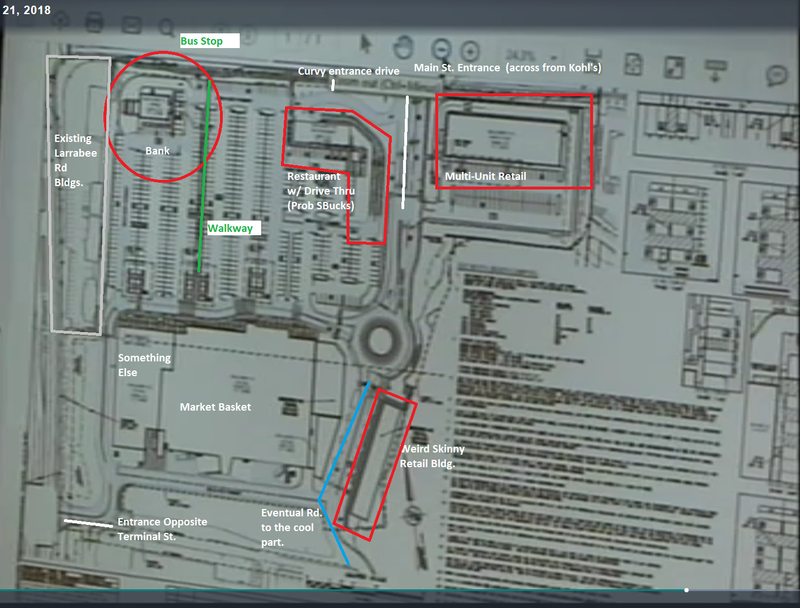 Phase 1 will be Market Basket, turned around to face Main St. with big parking lot in front and a couple of outbuildings, and later phases (the cool part) will all be behind that. I believe that they'll talk about the conceptual buildout of the site as part of that presentation. There was a fairly detailed layout for the site that they showed, but the only handouts were text about their "10 Principles," etc. * They talked a lot about tying into the Portland Trails network, working with Metro, maybe even down the road using the railroad for transit. * Their list of inspirations for the project includes The Grove in Hollywood (right next to CBS Television City and often seen on TV) and most particularly Avalon in Alpharetta, Ga. Phase 1 will be Market Basket, turned around to face Main St. with big parking lot in front and a couple of outbuildings, and later phases (the cool part) will all be behind that. It'll be interesting to see what the Planning Board thinks about this, because I believe their preference was for the developers to build against the road and have parking behind that. The Gateway zoning may actually even require. At the workshop, the Planning Board chair took great pains to have the city planner say that, if the changes are within and meet the intent of the ordinance, then the developer should be able to expect an approval. I don't know what's in the ordinance, but honestly I can't imagine that building with the back of the box up against the streets is going to be an improvement over the traditional shopping center pattern for that block, particularly with everything that's planned for the rest of the parcel. Personally it's a sacrifice I'd be willing for the city to make to get what's planned for the rest of the parcel. While I loathe the traditional strip mall parking-in-front look, as long as there are smaller outbuildings along the street-side of the parcel and the rest of the parcel gets developed as planned, I could go along with it. Here's the American Journal story on the presentation from last week. "Eventual road to the cool part" made me chuckle. It's funny, because it's true. 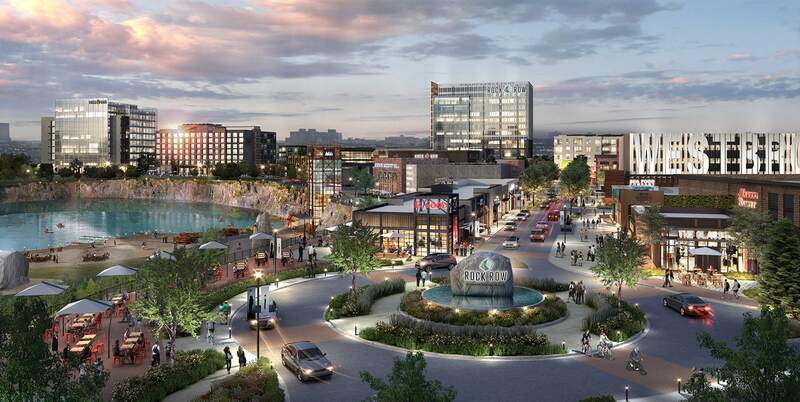 That skinny retail building looks like it's going to be a row of quick-serve style restaurants to create an outdoor foot court right along the boardwalk around the quarry pond. 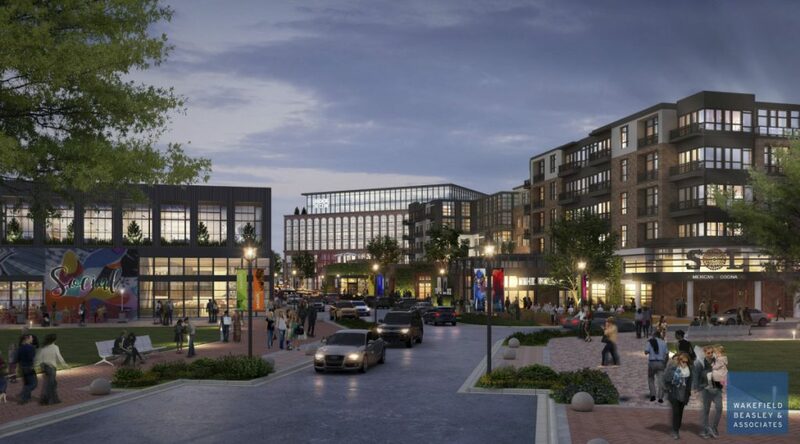 There are some new renderings up on the Rock Row website. This project just keeps getting scaled up. I don't know if these renderings are really indicative of the final master plan but I'm liking those 8-10 story buildings.